Hello people of the internet!!! On today’s ‘Monday Memos’ we have a new book review courtesy of Patchwork Press. Today we’re going to change things up a little bit by reviewing 2 books in 1 blog post. I was given the AMAZING opportunity to not only review the 1st book in a new series, but also the prequel novella. Because of how the books are written, it just makes more sense to give you all of my thoughts in 1 review so you can truly know if this series is for you. So 1st up we’re briefly discuss the novella entitled ‘Where We Were’, followed up by the 1st main book in the series called ‘Four Of A Kind’, both written by Kellie Sheridan. So now on to the review. Ready? Ok, let’s go!!! 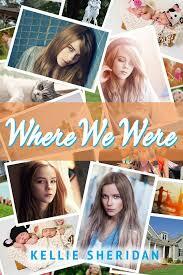 In ‘Where We Were’ we meet our 4 central characters: 14 year old quadruplets Reagan, Reece, Reilly, & Rhiannon Donovan who are in the process of moving from their home in Richmond, Virginia to a small town in another state called Fairview. Throughout the book we get alternating chapters in which each girl narrates what’s going on in each of their lives in the final weeks before their move. This novella does a really great job of showing us each girl’s individual personality, as well as what their sister’s think of them through the use of a quote before each chapter begins. ‘Where We Were’ perfectly sets the stage for the beginning of ‘Four Of A Kind’, which is told from Reagan’s perspective & begins once the girls have moved to Fairview. We immediately see that the entire town has such a fascination with the girls’ birth, that they are minor celebrities in town. 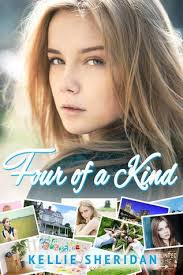 The story follows the girls (through Reagan’s eyes) as they deal with typical teenage drama such as friend & relationship issues, as well as trying to find their own identities in a town that watches their every move. So now that you know the plot, let’s look at the book a little closer. First of all , Reagan is one of my new favorite protagonists. She is relatable, interesting, and most of all someone who you don’t mind spending the entire book with. She wasn’t a perfect character, but she was the kind of person that you can definitely see yourself befriending in real life. Now let’s move on to the love interest Kent, the son of a local reporter. Thank goodness for Kent! It is SOOOO hard to find a love interest in young adult literature that is loveable. They do exist, but they’re hard to find. I know that we are all tired of the bad-boy, the rebel with a heart of gold, the emotionally/physically abusive guy that our protagonist falls for because they’re “wounded inside”, basically the ‘you should never actually date this guy trope’. With Kent we don’t see any of this, instead we get a nice, friendly guy from beginning to end, he respects Reagan & honestly always seems to want what’s best for her. I thought that at some point he would turn on Reagan to help his mother write a scandalous story about her & her sisters but he never did. Needless to say there is definitely a great need for more characters like Kent in young adult literature. Next I really want to compliment the author on her awesome writing style. Although the story is told from Reagan’s point of view, you really feel like you get a sense of each sister’s personality. In both stories each sister is instantly identifiable, & none of them feel as if they get lost in the plot. We also get some diversity through the character of Reilly when we find out that she’s a lesbian. Although this is not thoroughly explored, it also doesn’t feel like a tacked on label in order to check the diversity box, but instead a real part of who the character is. Honestly there is so much that I can & do want to say about this book, but I would have you here all week. This is one of those truly great books that you instantly know will be one of your favs as soon as you finish it, & this definitely made this author an auto-buy author for me. With all that said I HAVE to give these books a 5 smiley face rating because I will DEFINITELY be re-reading them again this year, & look forward to reading the sequels that are already out, & any additional books in the series that are released in the future. All photos and information used in this blog belong to kelliesheridan, Twitter, YouTube, Instagram, Pinterest, Kellie Sheridan, all companies, individuals, corporations, managers, writers, producers, authors, publishers, and/or businesses that should receive credit for any book(s), mentioned in this blog post, all of the and all companies, individuals, corporations, managers, writers, producers, and/or businesses that should receive credit for anything mentioned in this blog post, and all original owners. I do not own anything in this blog. If any people, corporations, businesses, companies, etc, were not previously given credit for their work, they are given credit now and their previous absence was unintentional. All opinions expressed in this blog are my own. I wrote this blog for entertainment purposes and no copyright infringement is intended. celindareyesblog August 7, 2018 No Comments on Monday Memos: ‘Where We Were’ & ‘Four Of A Kind’ by Kellie Sheridan Book Review. Category: Book Reviews, Monday Memos. Tagged: 2016, 2017, 2018, amazing, best book of the year, book nerd, book review, bookish, friendship, instagram, Kellie Sheridan, kelliesheridan, new, pinterest, romance, twitter, YA, young adult, youtube.